Sunday, Dec. 16, 1888 Quite foggy morn, & clouded over all day, growing colder tho' Mercury 38°+ first P.M. Muddy after quite little rain in night. Our folks appear about as well, Ellery attended service A.M. but so damp Clara & Karrie were not at s-school. All spent eve at home. After another good nights rest as well self, & with plenty reading at rest as usual. 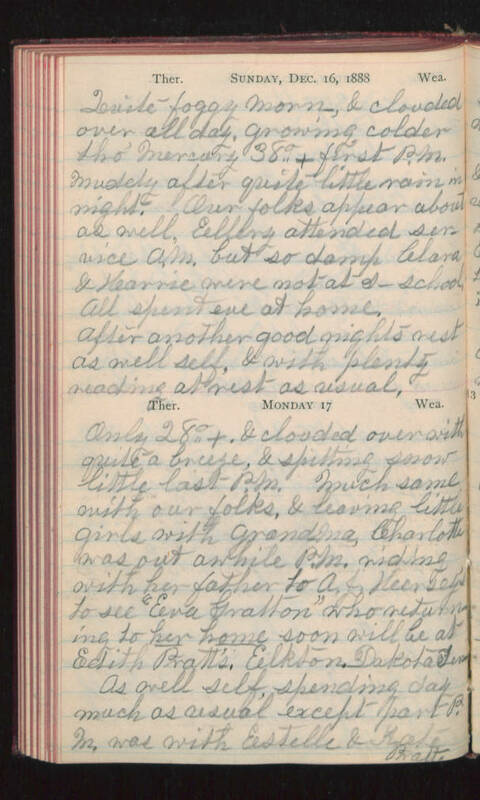 Monday 17 Only 28°+ & clouded over with quite a breeze, & spitting snow little last P.M. Much same with our folks, & leaving little girls with grandma, Charlotte was out awhile P.M. riding with her father to A. J. Hersey's to see "Eva Gratton" who returning to her home soon will be at Edith Pratt's, Elkton, Dakota Terr. As well self, spending day much as usual except part P.M. was with Estelle & Kate Pratt.